Prince Edward Island, is the smallest of the Canadian provinces both in size and population. 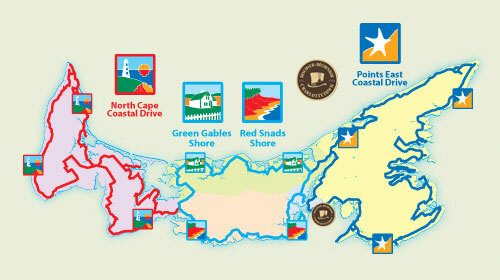 The Province is also called ‘PEI’, or simply ‘The Island’. The capital city is Charlottetown. They say that to be a ‘true blue’ Prince Edward Islander, you must be born here. Otherwise, you’re ‘from away’. Despite this divine right to citizenship, Islanders adopt all who come to stay as well as its 1.2 million annual visitors. They come to the Island to enjoy its pastoral scenery, relaxing white sandy beaches and relaxing pace. PEI is located off the eastern coast of Canada and is one of the four Atlantic Provinces, Charlottetown, the capital city, is roughly 1600 km (1000 miles) from Toronto, 1000 km (625 miles) from Montréal, 1100 km (650 miles) from Boston, and 1450 km (850 miles) from New York City. Spring is comfortable. Late May and early June are alive with colour and temperatures ranging from 8 to 22 degrees C (46 to 71 degrees F). Summer is hot, but rarely humid. We wear short sleeves. Daytime temperatures are usually in the 20s (70s) and can go as high as 32 degrees C (90 degrees F). Autumn is clear and bright. September afternoons can be quite warm, evenings cool. Temperatures range from 8 to 22 degrees C (46 to 71 degrees F). Winter is crisp and clean. Temperatures usually range from -3 to -11 degrees C (26 to 11 degrees F). You will find good beaches almost all around the Island.